Rent Hotel Deca | Corporate Events | Wedding Locations, Event Spaces and Party Venues. Originally opened in 1931, Seattle’s Hotel Deca is a stylish 158 room full service "boutique hotel" in the heart of Seattle’s lively University District. Whether planning a small executive retreat or an extravagant affair, we can accommodate meetings in an intimate or grandiose scale. Hotel Deca partners with a local Seattle audio/visual company to provide a wide array of special event equipment to meet your needs. The professional catering services team at Hotel Deca will help you with wedding planning details. They know how to ensure that this all-important occasion is seamless and special in every way, and work to meet specific space needs, menu requirements, timing and budget. Wedding guests will want to relax in one of Hotel Deca's 158 deluxe guestrooms and three penthouse suites all with contemporary art-deco motifs. This year, Hotel Deca unveiled over $2 million in property renovations including the newly renovated lobby area and guest rooms. 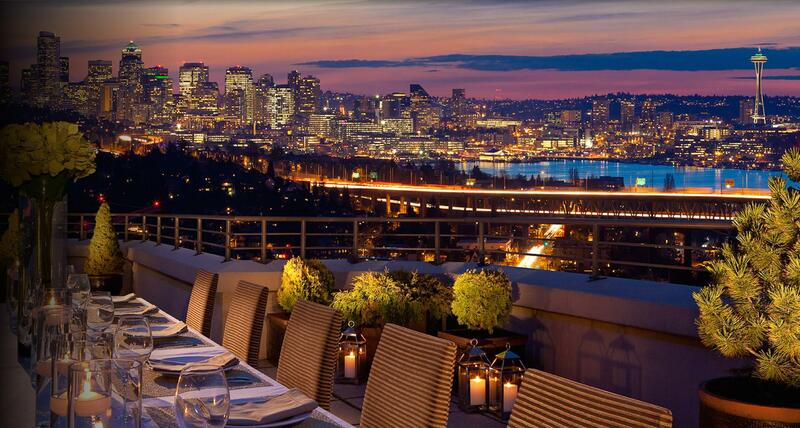 With its panoramic Seattle and mountain views. Hotel Deca is located close to all of Seattle's major attractions and close to the University of Washington making it an ideal location for families and friends to visit for your special event. 550 - 850 square feet. The Chancellor, College, Regent, and President rooms range in size and are ideally suited as smaller luncheon rooms or a bridal room. The Grand Ballroom accommodates 270 and is ideal for wedding receptions, rehearsal dinners and more. The Ballroom is fully renovated and retains the elegance and beauty of its original 1931 era with 18 foot high ceilings. The upper living room can be utilized for a reception.